​La Migra ("Border Patrol") heads up security at our laying hen pasture in Corralitos. She is our hardest-working, most reliable dog. ​Marley is La Migra's brother, and works with her to keep our laying flock safe. Marley is missing a few marbles, but what he lacks in brains he makes up for in brawn and does a great job under his sister's direction. Simba is the lead dog at our home ranch near the Elkhorn Slough. 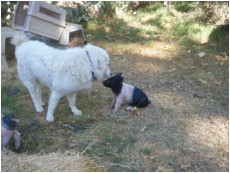 He is a Maremma dog, similar to a Great Pyrenees. As you can see, he's a total tough-guy... all business, that Simba. Chula is our youngest dog and is the daughter of Simba and La Migra. Her brother works on a pastured livestock operation in Hollister. Chula is currently out on medical leave, having sassed the wrong cow. She still has a bit of growing up to do, but can chase coyotes (and cows) with the best of them.